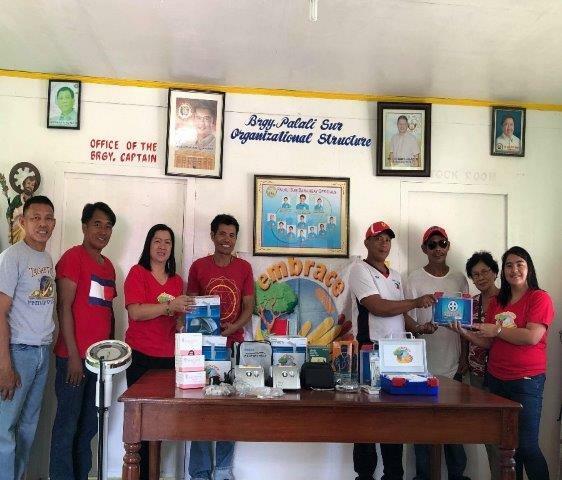 EMBRACE Turns Over Medical Equipment in Palali Sur – Jaime V. Ongpin Foundation, Inc.
A set of medical equipment (sphygmomanometer, nebulizer kits, first aid kits, thermometer and weighing scale) were turned over to the barangay officials of Palali Sur, Sta. Lucia, Ilocos Sur last November 26, 2018. Present during the turnover were Barangay Captain, Adonis H. Valdez, Barangay Kagawad, Dionisio E. Viernes, Dolores Haduca, Arnold S. Cabato Sr., Diosdado A. Dela Cruz Jr., Leonardo G. Gumangan & Reynaldo H. Haban and Jaime V. Ongpin Program Manager, Ester C. Liberato & Project Officer, Keren B. Cadwising. “Thank you so much EMBRACE for the donation you gave us. It is only now that our old and non-functional medical equipment will be replaced. The donation will be of big help to all residents of Palali Sur,” mentioned Barangay Captain Valdez.